A slight loss in appetite is considered somewhat of the norm in the senior years. There is several reasons why this occurs and in most cases it is a moderate reduction and not a cause for concern. 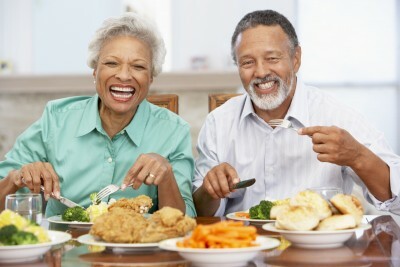 Sometimes a senior may experience an increase in appetite that is associated with frequent hunger pangs even a short while after eating and leading to weight gain. Here to it may not be a cause for concern but should be investigated as it can be a sign of several conditions. The appetite is largely determined by the amount of physical activity in a day. Seniors, particularly those who are retired, are often less active than younger people and coupled with the side effects of some medication there is a moderate decrease in appetite which is understandable. Two centers in the brain control food intake – the hunger center and the satiety center. The main factor that influences these two centers is the blood glucose levels and various hormones. When the blood glucose levels are low, a person feels hungry due to the activity of the hunger center. Conversely a normal blood glucose level as well as filling of the stomach will activate the satiety center which then decreases hunger. Although this is a simplistic explanation of appetite control, it does highlight the importance of blood glucose levels and even the stretching of the stomach in determining appetite. There are various other factors that may have some effect on hunger like the sight or smell of tasty foods and a persons mental and emotional state. Vigorous physical activity above the norm for a person. Stopping a medication that may have previously caused a decrease in appetite. Reduced absorption of nutrients from the gut. Bowel problems like sprue, celiac disease and short bowel syndrome. Hormone disorders like hyperthyroidism and acromegaly. Medication side effects or overuse of drugs for treating psychiatric disorders, diabetes mellitus, thyroid problems and nausea and vomiting in cancer patients. Is an increased appetite a problem? Slight changes in appetite occur throughout life for many reasons and does not pose a problem to one’s health. However, when there is a major change in the body, it can quickly disrupt the normal state of balance known as homeostasis. This applies to both an increase or decrease in appetite. Any prolonged change in appetite should therefore be considered as a problem especially when there is fluctuations of body weight, fatigue, drop in the immune defenses and a general feeling of being unwell (malaise) even when other symptoms as mentioned above are not present.